Every Sunday my kids like to pull out home videos to watch. A couple of Christmases ago my sister-in-law turned a bunch of our home movies into DVDs for my Christmas present. They are always the movies we end up watching because they are the easiest to access. I don't have to dig out the camera and the adapter to plug into the TV. Unfortunately, those videos are mostly of my oldest son. There are a few clips of my oldest daughter and none of my youngest girl. These days we take all of our home movies on our iPhones or iPads. They are all downloaded to my computer and stored on iCloud, but even though I have the best intentions of burning them onto a DVD, it rarely happens. I recently received the 3M Mobile projector to review and, even though I can think of a million fun ways to utilize this lightweight and completely portable projector, the thing I was most excited about was watching all of our most recent home movies up on thebig screen," also known as the wall of our living room, in a completely easy and convenient way. When the box arrived I pulled it out and, without reading the instructions, plugged it into my iPhone and started watching movies on the wall. It literally took me longer to get the 3M Mobile Projector out of its packaging than it did to plug it in and start projecting movies. All of the content on my iPhone and iPad, including my movies, YouTube clips, and all of the digital shows and movies we have purchased and rented can now be shown in big screen fashion. Just two days before the 3M Mobile Projector arrived we were all huddled on the couch around my husband's iPad trying to watch a movie that I had just bought. Oh how much easier that will be now that I can project it onto a screen, a white sheet, or my white living room wall. Heck, I could lay in bed and project it onto the ceiling if I am feeling extra lazy! With Mother's Day around the corner I am excited to stay in bed with my kiddos and watch home movies together. And with summer vacation right around the corner, I can see some neighborhood movie nights in our future. Laying outside on blankets, eating snacks and watching something fun. Our neighbors have a pool and I am sure I will be able to talk them into letting us have a few movie nights where we can watch shows while floating on rafts in the pool. This fun gadget is going to be getting a lot of use. Movie-theater-themed parties, photo slide shows for birthdays, keeping the kids entertained before bedtime while the adults have a game night. And because the projector is completely portable and can be charged ahead of time, I am not limited to having these fun activities inside my home where an outlet is available. I could even take it camping and watch a movie on my tent wall! Now that is my kind of camping! It is like having my own mobile movie theater. 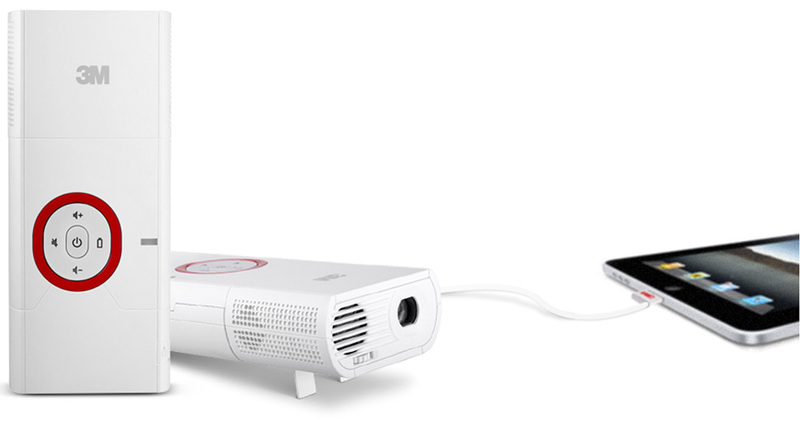 I want to hear what type of fun you would have with your own 3M Mobile Projector. Leave me a comment sharing your favorite way to do family movie nights and you will be entered for a chance to win a $150 Target gift card. These fun projectors are available at Target, by the way! Click here to learn more and find special offers. This giveaway is open to US Residents age 18 or older. Winners will be selected via random draw, and will be notified by e-mail. The Official Rules are available here.This sweepstakes runs from 5/21/12 – 6/29/12. Be sure to visit the 3M Mobile Projector brand page on BlogHer.com where you can read other bloggers’ reviews and find more chances to win! where wouldn't I use this!!! Actually, I'd probably use it most in my craft projects, making the lettering on large signs. We do Family movie night once a week .. we all gather up on the couch and watch a Action movie .. we have been known to watch transformers weeks in a row ... When Daddy's away on Business trip we like to do Party night which includes pizza and a movie. I can imagine plenty of summer evenings spent in the complex pool, with a movie (or HIMYM episodes, let's be honest!) going on the side of the building under the stars. My friends would love it! So awesome! We usually do family night with everyone squished onto two couches and crowded around the TV. We would love to use this on our family room wall so that we could all spread out a little bit for movie night! We usually make a pallet in the livin room but I would LOVE to do a movie night on our deck outside!! This would be so fun to use with home movies! We usually have family movie night in the living room, snuggled among bean bags, pillows and blankets... with a bowl of popcorn, of course! We like ot pull out the sleepings bags and have a mini-campout. My kids are planning an outdoor movie night with some friends...this would be perfect of the party! We get into pajamas and share a bowl of popcorn on the couch. In the summer we use our big ol' clunky projector and a big white sheet for an outdoor movie night in the backyard! I have tons of videos of my boys on my phone. What an awesome way to share them with family! I can picture it now... all snuggled on the couch watched the projected videos! I would love to have an outdoor movie night - so fun! We do family movie night on Friday. We gather around the tv and just spend time together. I love to watch a good movie, and enjoy a bowl of popcorn. We have movie nights every week, usually on Friday night. We all get in our pajamas, bring lots of pillows and blankets into the room and eats bowls of popcorn! This would be so fun for Outdoor movie nights! I would love to have all the neighborhood kids over to have a outdoor movie night. So much fun. I was literally just saying that we needed to find a projector that would work outside so we could have summer movie nights in the park down the street from our house! This would be perfect!! If we had one of these, the only thing left to do is grab some blankets, snacks and the kids - instant movie night! I have four kids and home movies are my kids favorites!!! Would love to have this product for our family! We have a huge wall in our family room so it is perfect to make more family memories! Family movie night is only complete if we build a fort from couch cushions and make special movie snacks! OMG, my kids would love this!!!!! My son just recently had surgery, for a week or so before we designated the day after his surgery as movie day...tons of snacks, sleeping bags and the rule of PJ's only. We had such a fun day (even post surgery!) that we decided to do it monthly. We would love this!! This is perfect for vacations when we want to watch a movie in a hotel room off the ipad! I would love to do movie nights outside this summer! This is so neat! It would be fun for a backyard "camping" night with the kiddos! My kids and my neighbors would LOVE this projector! We have the perfect spot to project a movie for outdoor movie nights! Fingers crossed! i love watching a movie with popcorn! OH this would be perfect in our finished basement, which my poor hubby did by himself over three years! He'd LOVE this! id love to put this outside and watch our scary movies out there! 3. And of course, not having to worry about mounting a big projector on the ceiling saves a ton of space and makes the room look less cluttered! Slumber parties for my little girl and her friends in their blanket forts, movie night in the back yard while roasting marshmallows--that would be so much fun!! We get out lots of blankets and make beds on the floor. It involves pillows, stuffed animals, and of course, popcorn! We host big Halloween parties and love to show movies. What a great addition to our party. I love making a platter of nachos & giving the adults a cold beer for a movie night :) I would LOVE to win this!! Hmmm, We watch most of our TV online anyway, so this would be awesome! Or using it for craft projects...I want a projector! a glass of wine, popcorn and candy! We would have so much fun with this on one of our many themed movie nights. We just had a Shakespearean party where everyone dressed up, and we had themed food. If we have this, these parties can be so much more fun!!! We rent from redbox, make or order pizza and have chocolate milkshakes. We think this makes for the best family nights! This would make them even better. How cool! We usually put a blanket on the floor and pop some popcorn for the kiddos when we have family movie night. I was sitting on the front porch chatting with my neighbors and enjoying the gorgeous weather the other day. I was actually thinking how fun it would be to find a way to project some movies onto one of our neighborhood walls and have a movie night with all the kids. Wouldn't it be fun to have everyone decorate boxes to look like cars and have a drive in movie night? Ooh, I'd really love this now!!! favorite way to enjoy family movies is on the couch snuggled up with lots of blankets and popcorn!!! would be awesome to be able to enjoy a night outside though?! We love family movie nights! My kids would love backyard movie nights using the 3M mobile projector. Thanks for the chance to win the Target gift card. Friday Night Movie Night comes right after Friday Night Pizza Night (usually homemade, sometimes from the freezer section - and every once in a while, it's corn dogs and curly fries). I find a family friendly movie and after dinner everyone gets into pajamas and we hunker down and watch the movie. Since there's no t.v. or video games in our house, they LOVE Friday Night Movie Night! we try to watch at least a movie a month. i'm trying to make up for those i missed when i was younger, which is pretty much everything! thanks for the giveaway! This sounds so cool! Thanks for the chance to win! It would be so awesome to have a movie night outside under the stars!!! Crossing my fingers!!! Between a new home and a big barn out back, I'm sure we could find some great places to have a "big screen" movie! Friday nights - curled up on the couch with some popcorn and a bottle of wine for my husband and me! Best way to watch a movie! I have been dying (as it looks like many of the comments agree)to do an outdoor movie night with the family this summer. We have family coming to our farm to spend some time this summer, it would be great to be able to put a screen outdoors and watch movies on blankets! This would be great, not only for the family but for a work party too! I would host a family "dive in" and show movies on a sheet at the end of our pool this summer. That is really fun. An outdoor movie sounds like lots of fun for summer! My only question is about sound. Did you hook up speakers too? I love this!! Family night would be awesome. Block movie night with the neighbors. We could have lots of fun!!! It'd be really fun to watch laying down on the floor with with the image being projected onto the ceiling with the kids! My extended family is all about movies, so I'd love to have big movie nights all together - maybe even on the side of my parents' barn! I love doing movie night by cuddling up on the couch with my husband while eating delicious homemade popcorn. We love to pop some popcorn and cozy up in blankets to watch the show. This is such an amazing giveaway, thankyou! Popcorn and some sort of boy movie is a must. Craftin' by day, movies by night! How cool is that! We do family movie nights in the living room. Sometime we pull out the sleeper sofa and lie in bed watches the movie. For this one night, we overlook the "No Eating in the Living Room" rule. Our favorite way to do family movie nights are to get in PJs, make some popcorn, lay a blanket on the living room floor and hunker down as a family together. So fun! that's pretty cool that you didn't even read the instructions...that's how i roll myself. didn't think about viewing the videos i have on my phone. very cool. This would be great! We like to camp and wouldn't it be fun to show a movie outside! Wow, this is SO COOL! I love how easy the "setup" is, as I am not the most technically able/patient person :) This would be amazing to use outside for an outdoor movie theater. We are throwing my dad a 70th birthday party in September, this would be an awesome way of making an event like that more fun/special! This 3M projector is totally cool…I would love to have one so I can bring the movie night outdoor, especially in the summer. I love family movie night. My son and daughter takes turn picking a movie to watch (limited to 1 per night though). I’m always the one who prepare the snacks and drinks for our fun night cuddling on the couch. Family movie night would be at the top of the list for us!! Would love to have this 3-M projector for movie night when my granchildren come to vist so they wouldn't think Grandma was out of touch because she didn't have the newest invention available. I'd love to have a movie night outside in our backyard! Awesome!!! I would love one of these. I've been dying for one of those!! Had no idea there was one that was compatible with an ipad!!! So great! An outdoor movie night under the summer stars would be fabulous! This would make our family movie nights so much more fun!! Our favorite way to do movie night is to plop on the couch after we’ve grabbed a bowl of popcorn!! Thanks for a chance to win and have a great day! We do loads of movie nights at our house (perfect staycations!) and this would be so awesome to own! With this, we can do backyard movie nights over the summer! We would lov one of these projectors! We have a great huge wall that would be perfect and we could finally get rid of the monster of a big screen thats i dont know how many years old! OLD! Surrounded by pillows, blankets, and popcorn of course! Oh and candy. Can't forget the candy! I would have a family movie night and invite many relatives over. Snuggled up against my husband on the couch with the windows wide open, after we put the baby to sleep. That's how we roll for fam movie night. I would use this to entertain my son and the eight friends that he brings over for "Movie Night" almost every Friday. They have a downstairs playroom - imagine how cool it would be for them to watch their movies on something so big!! I would use this for our annual neighborhood movie night! With this baby we could have movie night every week!! Movie night every night during the summer! I'm currently working on a video for my dad's 70th birthday...this would be PERFECT to watch it on! This in on my "Wanted" list! I'd use it for movie nights outside, wall murals,signs, for decorative paint treatments on furniture...lots of things! I like to do snacks around the theme of the movie. We love to do movie night in our basement family room. It is dark and cool space, perfect for cuddling up and watching a movie! My kids think that popcorn should be a part of almost every activity, so it is definitely always part of movie night! Thanks for the giveaway! Oh me,oh my...My teenage boys would LOVE this!! We would use it just about anywhere...on the deck snuggling under a blanket. In our basement family room...or anywhere else the imagination can go! We love movie on the house. This would be great! I cannot believe of such a wonderful item. The things I could do would be first to make some movies and then use it to project some items onto wood. I would so love this handy tool in my craft room. We like making popcorn and pouring a bowl of M&Ms and putting on a family friendly movie. We love family movie night on weekends and in the summer! We don't watch a lot of family movies because they are either stuck on my phone or in old video tapes. This is a great way to see the ones on my phone. The kids would love this and grandma too. Thanks for sharing about it. I'm wondering if it will share an image from my phone so it can help me do a wall mural in the boys room? hmmm....something to think about. I can just see us all hanging out in the backyard during the fall/spring months having an evening picnic and watching Cars or Cloudy with a Chance of Meatballs projected onto a white sheet tacked up to our patio roof. This would make such an awesome option for birthday parties and sleepovers! Homemade pizza and desserts, a great family friendly movie to enjoy together with kids- my favorite way. I'd love to win it! We just bought an A-frame travel trailer and this would work so great on the ceiling of the trailer. A little Jiffy Pop and we'd be all set! Thanks for the giveaway! We move everything out of the main space in the living room, and get out all of our biggest, fluffiest pillows and cuddliest blankets, and share a big bowl of popcorn on the floor. Even the kitten joins in! We order pizza and pop a big bowl of popcorn. This would be great to use for movie night outdoors in our enclosed back porch. we usually eat pizza and just sit back and enjoy the movie. When we have a new house though, with a backyard, I definitely want to have outdoor movie nights! I hope to one day have an annual outdoor movie night for all of our friends nad family- it might even make a great 4th of July tradition! We would show old family photos and movies that my mother in law put together before she passed away. What a cool gadget. It sounds great! Movie night is sitting on our bed, eating popcorn and laughing all night long! We have a family movie at least once/week. During the summer... this would be so awesome! We would have so much fun with this. We like to pack a picnic and go to the outdoor movies in the park. We would have fun projecting a slideshow of pictures of the kids when visiting grandparents or letting little ones watch a movie or show while big brother plays a ballgame! I would sit in a raft every night and project movies on sheet.!! Oooh that sounds divine! I just recently found a cute blog full of ideas for decor and treats coordinating with movies for kids. My kids are going to love our Saturday movie nights even more! We do family movie night on our couch with bowls of popcorn between us! My favorite way to do family movie night is to make some homemade popcorn with variety flavors such as caramel, white cheddar and classic butter and watch movies on Netflix. Yep, this has movie night written all over it. What a great way to build community with the neighbors--watch a classic like Star Wars outside at the park! I love family movie night. We don't really have a SET way of doing things, but I like when we're all together...watching something everyone wants to see....and we got some yummy popcorn. I would set up a sheet on the side of the house to watch movies from inside the pool. This would be so awesome. I'm going to do a Lightning McQeen drive in movie party for my 3 year old this week. We love hanging out on the sofa with a big bowl of popcorn. The projector looks awesome! I think it would be awesome to set it up drive-in style and watch a movie outside! We watch movies on hdtv with xbox streaming, it would be nice to be able to watch movies in bed or in the yard with the projector. Thanks for the review and giveaway. I would use it a lot for crafting. For movie night it would be a lot of fun. We usually eat pizza or popcorn and then all pile in the "family chair" together. Oh my word it would be fun to have one of these. I've always wanted to have movie nights outside, but there are so many other fun ideas that people are posting. What a great product! We would have such a blast with a projector lie this one! We usually have friends over and watch movies. It'd be a much more enjoyable experience with one of these! Sounds so magical! I would also love to use this to project home movies - our favorite thing to watch! Oh so many ways to embarrass the husband and kids. Let's do this! I make homemade pizza and when it's fresh out of the oven we start the movie and then have ice cream for dessert! oh my goodness so much fun, i think we'll throw a cutesy summer movie event where we'll event friends and family and charge an admission of maybe "canned foods" or clothes to donate to local shelters! We cuddle up together on the couch & watch our big screen tv together. With a projector, we could do it more often, or even take it out to the farm. We do friday night pizza, game, and/or movie night each week. We start with a picnic of pizza and then put our pjs on to watch a movie while snuggling under covers. I would love to do an outside movie in the summer, but the traffic by our house is too loud. We do movie nights once a week and being able to watch on the wall would be great! We would use this for movie night in the living room- everyone in pajamas and sleeping bags. So when the kids fall asleep we can choose to leave them there! We've been looking for an inexpensive projector to turn a room in our basement with no windows into a home theater. This would be perfect! I'd just like to make a movie big enough that there is not "good seat"! We would watch kids movies outside with the grandkids! So fun!